Conventional interlocking structures rely on keys or connectors at the periphery of their elements in order to keep them together. This system inevitably exhibits a large stress concentration around the connectors when subjected to a lateral or dynamic loads scenario. However, substituting the keys or connectors with non-planar surfaces on all sides reduces the stress levels at the contact locations and enables a low degree of freedom, as well as other functionalities. 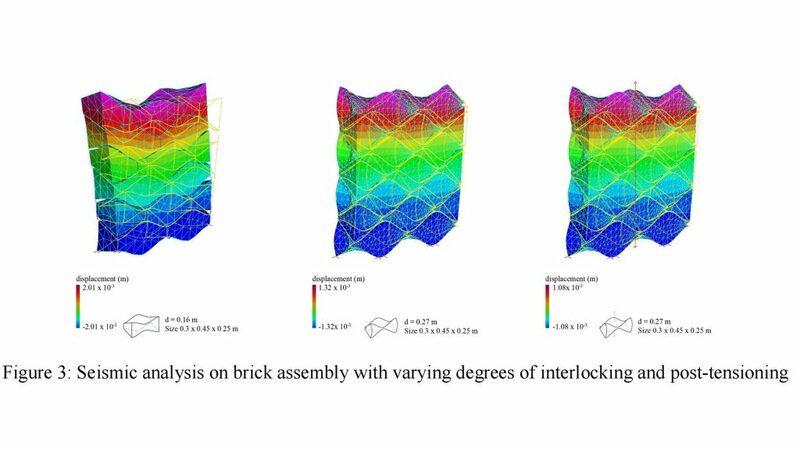 This paper proposes a material system of topologically interlocking, mortarless bricks—taking cue from the “osteomorphic” brick—for the construction of seismic-resistant shell structures in Istanbul, a city expecting a devastating earthquake, where its unpreparedness in a high dense urban fabric occupied with structurally unstable buildings constitutes a great danger to people’s lives. The system incorporates non-planar surfaces with a sinusoidal feature and a controlled degree of curvature to complement the brick, which facilitates the dissipation of energy through surface friction when subjected to different loading conditions. This is coupled with a post-tensioning system that is located to optimize the handling of induced stresses of applied lateral and dynamic forces on a shell morphology.